Marinate sirloin steak chunks in A.1. 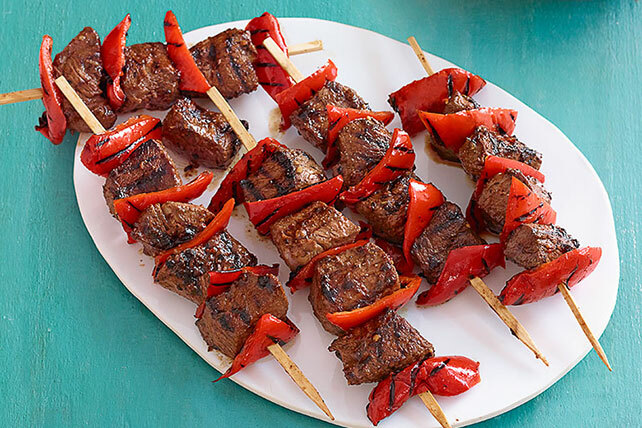 Classic Marinade for these delicious Beef & Red Pepper Kabobs. These kabobs are skewered with beef and red pepper and grilled to perfection. Pour marinade over meat in shallow dish. Refrigerate 30 min. to marinate. Heat grill to medium heat. Remove meat from marinade; discard marinade. Thread meat and peppers alternately onto 8 skewers. Grill 5 to 7 min. or until meat is done and peppers are crisp-tender, turning occasionally. Combine remaining ingredients. Serve with the kabobs. For more color and flavor, stir additional chopped red peppers into the rice mixture before serving.